Traveling for work or a conference can be a real strain. Luckily, downtown OKC and Bricktown have undergone a great renovation over the last decade to become ideal spots for convenient business travel. Bricktown offers a wealth of modern and comfortable hotel options, and everything downtown is centrally located to be completely walkable. At Mickey Mantle’s Steakhouse, we’ve been in Bricktown for over 15 years and have had a front row seat to downtown Oklahoma City’s renaissance. From the cutting-edge Bricktown Ballpark to the ever-growing canal walk, Bricktown offers so much to do during your downtime. If you’re looking for a cool, upscale place to unwind with a cocktail or glass of wine after a busy day, there are many options for that as well. Get a lay of the land and decide on the perfect hotel with our handy guide and map below! Not only is Hampton Inn & Suites closest to Mickey Mantle’s for your after-business (or pre-meeting) needs, the south facing rooms also overlook the iconic Bricktown Ballpark, which is a refreshing sight to wake up to. They offer many amenities to business travelers to Oklahoma City, including a free hot American breakfast, high-speed internet throughout the property, and a modern fitness center. They also offer a complimentary and well-equipped business center for A/V rental, copying, printing, and whatever else you may need to get the job done. 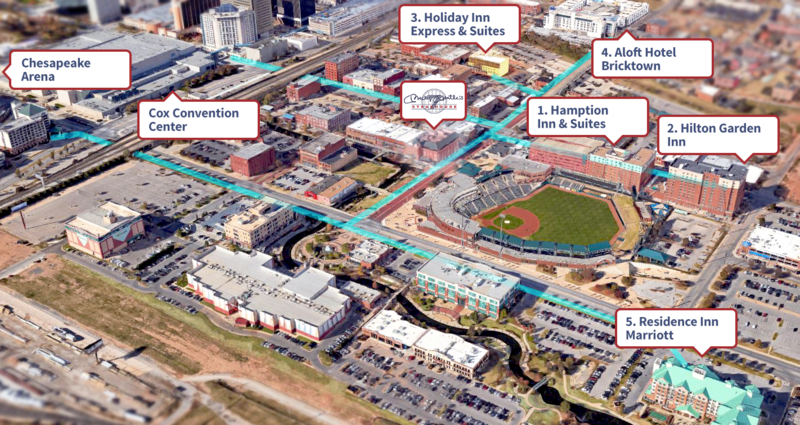 The Hilton Garden Inn in Bricktown is located right next door to the Hampton Inn and offers many of the same amenities. 24-hour fitness center access, an on-site business center for last-second file management, and a heated indoor pool are just a few of the luxurious features of this hotel. Each room also features a Keurig coffee machine, mini fridge, and a microwave to prepare any treats you might purchase from the 24/7 convenience store available to hotel guests. There’s a convenient option for your late-night needs or cravings while on the road. The Bricktown Holiday Inn Express is one of the newest hotel and suites locations in the city and offers many modern amenities. They offer a complete continental breakfast buffet as well as a full breakfast menu. They’re also right next door to a fantastic coffee and tea shop, All About Cha. As far as features for the modern business traveler go, they also offer an on-site business center to prepare documents or scan files for upload. All rooms come equipped with high-speed internet, so you’re never left without a link to your business. Add in a complete fitness facility and the Holiday Inn is a great option for business travelers. If you prefer a swanky, more unique base camp for your business travels, Aloft Hotel overlooking Bricktown in OKC could be the perfect spot for you. They offer two great hangout areas in the full-service XYZ Bar and the Re:mix Lounge. With a cool, upbeat atmosphere and convenience, it’s the perfect spot to wind down before you head to your room for the night. Business benefits include swanky meeting spaces, a modern gym to refresh your body, and a pool to relax in after a long day of mingling. Located right near the Harkins Bricktown cinema and various restaurants lies the Residence Inn Marriott. The only hotel on our list that lies directly adjacent to the Bricktown canal, the Residence Inn is a great starting point for adventures in this dynamic OKC district. It’s the longest walk to the various convention centers, but very close to the Chevy Events Center and the Bricktown Ballpark. Sporting a pool, hot breakfast, and fitness center like many other hotels, the Residence Inn also offers event and breakout spaces for various sessions you might have. Overall, Bricktown offers the best variety of hotels in OKC. Their business traveler-friendly offerings cater to the tens of thousands of visitors coming to the city each year, and you’re bound to find the perfect place for you. Best of all, Mickey Mantle’s Steakhouse and #7 Lounge is centrally located in Bricktown OKC to offer you a great spot to dine or unwind with a drink (or cigar) after a hard day’s work. Check out our menu page and make your reservations today.